This historic overview was compiled and edited by David L. Kay, Esteemed Leading Knight, 2011-2012. Our Lodge was born August 26th, 1912 and the initial installation was October 24, 1912. The meeting was opened by DDGER Walter Detwiler with 28 members attending. During the years 1912-1913 Lakleland had matured from its frontier town beginning and was starting to blossom into a small city. Downtown Lakeland was flourishing. In 1902 Napoleon Bowyer built a building on the North East corner of Pine Street and Kentucky Avenue which was referred to as “Lakeland’s first Business block”. Mr Clonts constructed a dry goods and mercantile store one year later in this block. Most businesses around Munn Park were 10-12 years old by 1912 when our Lodge was organized, which was very popular with shoppers as well as a gathering place for town gossip. Life had been quite hard during the early years and remained so by today’s standards. People survived by helping each other in times of need. Perhaps it was this bond of brotherhood that brought a group of men together with the idea of forming an Elks Lodge in Lakeland. On October 24th, 1912 a delegation from Tampa Lodge #708 met in the Morgan Grover building with 28 charter members from Lakeland, for the purpose of installing Lakleland Lodge #1291. Our very first Exalted Ruler was Oscar M. Eaton. The Morgan Grover Building was shared with other fraternal organizations at this time. We met there for some months until the Spring of 1913, when J. Skipper erected a building on Main Street south of Munn Park. The third floor of this buliding was arranged for our Lodge. The famous clothing store occupied the ground floor along with Dr. Getson, a dentist. The founders of our Lodge leased these quarters for a period of five years until the completion of our new quarters on Massachusetts Avenue. Our Charter having to be signed by the Grand Exalter Ruler, Edward Leach, was returned to us with a date of July 9, 1913. This must be the date of our birth of our Charter. The Lakeland Elks was incorporated in January of 1917, and on march 28th of that year, Logan Brothers of Tampa was hired to construct our building at 108 S. Massachusetts Avenue. The approximate cost of the building was put at $75,000.00. In 1917, the United States had entered into war and eighty-seven of our Elks responded to the call to serve. Much of the funds for our new Lodge were raised by non interest bearing bonds issued to members only. The majority of the bonds were bought by those dedicated Elks serving on the building committee. Construction was not quite finished on January 10, 1918, when we held our first meeting, but it was understandable how eagerness can overtake patience and the move was made early. 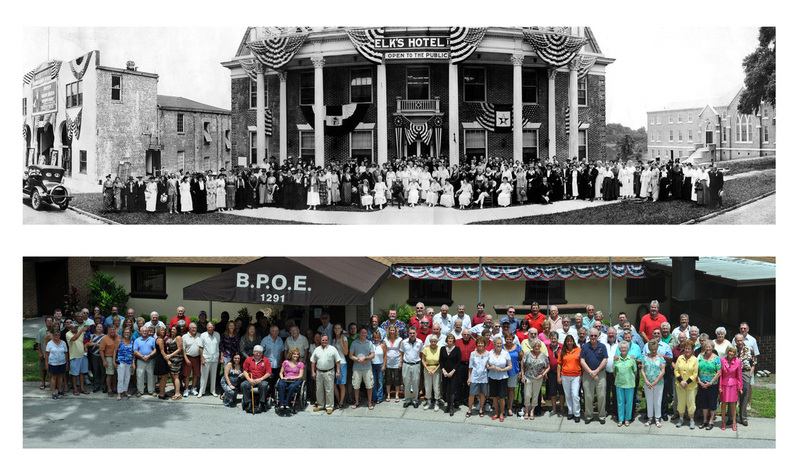 The singular most popular event to take place in lakeland up to this time was the Grand Opening of the Elks Lodge and the laying of the cornerstone. These cermonies took place on March 20th, 1918. The head count for for the festivities exeeded 2000. The total population of Lakeland at that time was only 9000. The honor of placing the cornerstone in position was accepted by the Exalted Ruler, Dr. F Bryan. During the early years of our Lodge, only two fraternal organizations were in existence. They were the Elks and the Chamber of Commerce and they were jointly involved in civic duties and social functions. On April 1, 1917, only three days after the opening ceremonies of our Lodge, Theodore Roosevelt gave a speech in Munn Park about the Spanish War and his experiences in Cuba as well as what was progressing in Germany. Our Lodge building proudly boasted having the only swimming pool in the state. It was located in the basement and an adjoining room contained a large boiler that provided heat throughout the building. The first person to use the pool was our ER, Tom Bryant, who cheerfully was thrown in, fully clothed, thereby commencing the christening ceremony. It was rumored that the pool water was pumped from Lake Mirror. Since the elevation was some distance above the Lake, drainage was probably acquired by the use of a hose as a siphon, there-by leading to the rumor of swimming in lake water. Whatever was the case, the Boy Scout Troop #103 , was there for weekly meetings and immensely enjoyed the pool. It later was converted into a storage area never to be used as a pool again. Entrance to our lodge, before the magnetic key card, was gained by a common key given to each member. This key would allow members entrance into any Elks Lodge in the country. The Secretary’s office was located in the lobby which also served as the Hotel Office. 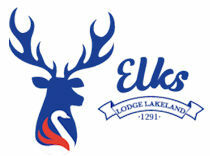 The sign read “Hotel Elk: and later was changed to “Elks Lodge”. Also, located in the lobby was the “Ladies Blue Room” where piano lessons were given and a meeting room was rented to local organizations for their meetings. A hallway led from the lobby to the dining room and lounge area, which contained large picture windows revealing a beautiful view of Lake Mirror. A large horseshoe shaped bar was located in the dining area. A staircase from the lobby led to the hotel on the second floor. The rooms were rented to the public for many years and later to members only. On the third floor we find one of the most beautiful lodge rooms in the state at that time. It had polished wooden floors and large arch top windows reaching almost to the ten foot ceiling. The floor around the walls was elevated about 8 inches and extended 3 feet out. This supported the elegantly carved officers’ chairs as well as seating for the members. The Lodge furniture consisted of four beautifully hand carved chairs used by the officers and a matching hand carved altar. These chairs were presented to us as a gift from downtown Jacksonville Lodge #221 and are cherished and used by our Officers today. The altar was damaged beyond repair and had to be discarded and a new one was purchased. The West side of the third floor opened onto a balcony overlooking Massachusetts Avenue. The balcony was a favorite place to relax during festivities such as the formal Elks Ball, as well as other dances held in the Lodge Room. The balcony was also a favorite place to observe the many parades which traveled down Main Street. The hard wood floors made the Elks Lodge a popular place to dance. Many Elks from around the State enjoyed our Lodge and we held the State Convention in 1921, 1925 and 1944.